Like in a heterosexual set-up, trying to approach a gay guy and ask him for a date seems like a really calculated routine. It would often start when you spot a hot guy by himself minding his business and you begin to scope him out. You casually go near him and pretend to do your own thing, and out of nowhere you strike a conversation with him. There would be some rejections, but there would be those magic moments when you begin to introduce one another and eventually go out on a date. More often than not, gay men would rather wait to be approached. However, doing so would lessen the chance for you to find great guys. Here are some useful tips that are helpful in your mission to become a dating magnet. Get out of your house! There are different opportunities for gay love in every city, if you are aware of your surroundings, and these are not only confined in bars. Keep your eyes open for flirtatious looks, comments, or gestures, at book shops, laundry mat, or even in a grocery store. Almost every place is a great venue for dating prospects. Once you have locked your target, look for an opportunity to approach him and seize it. In most cases-especially if he is alone-the guy would do or say something that gives you the chance to strike up a conversation. You can also try to get his attention and let him start a dialogue. 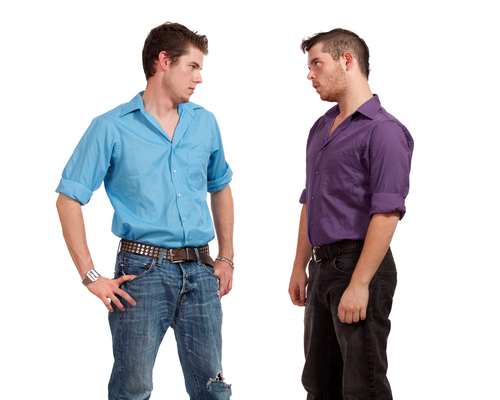 Most of the time, gays don’t fail in approaching other men; it is during the conversation phase that would cause the fallout. Keep the conversation going and flowing by talking and letting him speak. Make a comment or a joke that would make him laugh or at least smile. Don’t lose the opportunity. Check his reactions if he is also interested in you. If he seems that he is not, then shrug it off and look for other guys. Now the moment of truth: Ask him for his phone number or go out for a cup of coffee. If you feel comfortable to him, give him your number also. Let him know that you are interested in knowing him more. However, remember to call a few days after meeting. Tips from a fourth-grade Guru!